Mountaineer, Arctic researcher and dedicated extreme sportsman, he is not a man whom one could call a traditional adventurer. In spite of many spectacular expeditions, this journalist never made adventure his profession. “Vogeley is an exception”. His Nicknames “Manager on the Rocks”, “Arctic wolf”, “Dances on the Ice” reflect his position as one of the most succesful German-speaking adventurer. Having had adventures on all continents, he uses this to drive his daily work as a successful journalist and has documented this in hundreds of publications and in many books and films. “The life sailing close to the wind increases pleasure in normal life and sets important activities for life and survival in the profession”. He has lived with the natives of the Arctic, the Inuit, and is polar consultant and expedition leader of the DAV Summit Club. He passes on his experiences with extraordinary efficiency to enterprises and their staff in Outdoor Team Trainings. 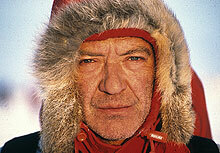 Self-imposed rules accompany his uncommon travels, expeditions and adventures pushing the limit.